Years ago, as automakers struggled to engineer electric vehicles that could offer practical driving range between charges, more pragmatic developers proposed overcoming the battery EVs range limitation with a range extender. Simply, this concept would add a small on-board gasoline or diesel engine to keep batteries charged and supplement electric propulsion when more power was needed. While no longer a true zero emission vehicle a key goal of electric vehicle enthusiasts the concept promised cars that would appeal to a mass market. It would provide significantly higher fuel economy than conventional automobiles and achieve near zero emissions levels, all the while offering performance, functionality, and affordability similar to that of the familiar internal combustion engine vehicles weve driven for many decades. This concept has evolved into todays gasoline-electric hybrid vehicle (HEV). Toyota and Honda can be credited with first producing HEVs that appealed to a wide spectrum of vehicle buyers. Toyota introduced its first-generation Prius hybrid in 1998 to the Japanese market. North America saw its first hybrids with the debut of Hondas two-seat Insight as an early 2000 model, shortly followed by the introduction of the Toyota Prius to American roads. Honda's HEV features the company's innovative Integrated Motor Assist (IMA) hybrid system that was detailed in Green Car Journal's Fall 2004 issue. Toyota uses its sophisticated Hybrid Synergy Drive system to power todays Prius, a follow-on to the first-generation Toyota Hybrid System. Both automakers are now offering their second generation hybrid vehicles. In 2003, Honda introduced the five-passenger Honda Civic Hybrid, which offers a more powerful adaptation of the IMA system. A completely redesigned and more powerful Prius appeared as a 2004 model. Both the Toyota and Honda hybrids are parallel configurations, with wheels driven by both their internal combustion engine and electric motor. In detail, however, they work quite differently. The Honda IMA systems electric motor/generator supplies additional power to the gasoline engine when needed for acceleration or when driving demands are greater, such as when climbing grades, thus the designation motor assist. The Honda gasoline engine always provides propulsion. Things are reversed with Toyotas Hybrid Synergy Drive, which finds the Prius starting out on battery electric power. The gasoline engine seamlessly starts up to provide additional power during acceleration, at higher speeds, or when driving up grades. This ability to run at times on battery power alone is an important distinction to some folks, since this means Toyotas hybrids are actually zero emission vehicles during the time theyre electrically driven. Hondas hybrids cannot do this. 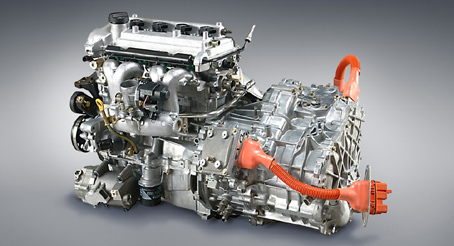 The Prius uses a four-cylinder, 1.5-liter Atkinson cycle engine. The four-stroke Atkinson cycle, invented by James Atkinson in 1882, is different than the Otto cycle engine were used to driving in very distinct ways. 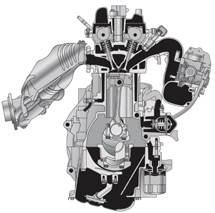 Compared to the Otto cycle, where the intake valve is closed near bottom-dead-center, the Atkinson cycle does not close the intake valve at BDC, but leaves it open as the piston rises on the compression stroke. What this means is that some of the air/fuel charge is pushed back out and into the intake manifold and is used in other cylinders. This reduces the volume of the air/fuel mixture thats compressed and combusted without severely restricting the throttle opening. Restricting throttle opening results in large pumping losses and greatly reduced efficiency. This method of reducing power output without incurring large pumping losses makes the Prius engine much more efficient than a conventional Otto cycle engine under most operating conditions. Effectively, the use of the Atkinson cycle allows the Prius engine to operate quite efficiently at relatively low power levels while still having sufficient power for climbing hills at freeway speeds. The Prius uses the same basic 1.5 liter engine as the Toyota Echo, where the engine is rated at 108 horsepower at 6000 rpm. The Atkinson cycle allows the engine to be downsized to 76 horsepower at 4600 rpm while still being as efficient, or perhaps more so, than the Echo variant. Also, adding a supercharger to the Atkinson cycle results in the Miller cycle like that used in the Mazda Millenia. Variable intake valve timing (VVT-I) reduces cylinder pressure to eliminate knocking, important because the engine has a 13:1 compression ratio. A high compression ratio, while good for performance and efficiency, can lead to pre-ignition (knocking), which can damage an engine if unchecked. The aluminum, dual overhead camshaft (DOHC) 16-valve engine produces 76 horsepower at 5000 rpm and 82 lbs-ft of torque at 4200 rpm. Because the engine speed is limited, it can use smaller and lighter components for improved fuel economy. The engine earns an Advanced Technology Partial Zero Emission Vehicle (AT-PZEV) rating, is a Super Ultra Low Emission Vehicle (SULEV), and has an EPA rating of 60 mpg city/51 mpg highway, for a combined estimated 55 mpg fuel economy rating. Toyotas HSD also takes special measures to address cold start emissions. Since combustion is not as efficient when an engine is cold and a catalytic converter must reach operating temperature before it can treat exhaust gases, cold starts result in greater emissions levels. The HSD system stores hot coolant in a three-liter vacuum bottle and dumps this into the engine during a cold start to help remedy this. Starting. The Prius accelerates from a stop using the battery and electric motor to drive the wheels. It accelerates to about 40 mph before the engine is started so it can operate within a narrow rpm band for optimum efficiency. The engine also operates when needed at lower speeds where it is less efficient and consumes more fuel. Normal Driving. When cruising speed is reached, the engine is started to drive the wheels and the generator, the latter supplying electricity to charge the battery and power the electric motor as needed. Acceleration. When extra power is needed for acceleration or hill climbing, electrical energy is supplied to the motor from the battery and generator. Deceleration. During braking or coasting, energy is recovered through regenerative braking to recharge the battery. Stopping. When the Prius comes to a stop, the engine is shut off to conserve fuel, and then the acceleration cycle starts again as described above. The permanent magnet, AC (alternating current) synchronous motor produces 67 horsepower (50 kW) at 1200-1540 rpm. Most importantly, it produces 295 lbs-ft of torque at 0-1000 rpm, more than enough to get the car going without help from the gasoline engine. A sealed nickel-metal-hydride (NiMH) battery is used. An inverter converts the batterys DC (direct current) to AC for use by the electric motor and generator, and vice-versa. Precise current and voltage control is assured by an intelligent power module. A built-in transformer converts some of the hybrid batterys power into 12 volts DC to operate vehicle accessories. In the latest generation Prius, the high voltage converter system increases battery voltage from 202 volts to 500 volts for driving the electric motor. This reduces power loss by up to 25 percent because electricity can be supplied at lower current, ensuring large amounts of electricity to the motor for significantly greater output while allowing for a smaller battery. The Prius transaxle contains a planetary gear that adjusts and blends the amount of torque from the engine and motor as its applied to the front wheels. It also functions as a continuously variable transmission (CVT) with drive ratio controlled by varying the rpm of the generator that also runs off the planetary gear. This Power Split Device allows the engine to operate in its most efficient load and speed range most of the time. The planetary gear system connects the engine, generator, and motor together, allowing operation in a parallel hybrid mode with the electric motor and gasoline alone or together powering the car. It can also operate like a series hybrid when the gasoline engine operates independently of the vehicle speed to charge the battery or provide power to the wheels. Finally, it allows the generator to start the engine so a separate starter is not needed. Toyotas Hybrid Synergy Drive is presently packaged in the sleek, aerodynamic, and efficient five-door Prius hatchback thats officially classified as a mid-sized car, quite a leap forward from the compact and somewhat quirky first generation Prius. This advanced hybrid vehicle shares virtually nothing with other Toyota models. Features include a throttle-by-wire and an electric air compressor for the air conditioning. Hybrid Synergy Drive is quite scalable, so expect to see it used in other Toyota and Lexus models. For example, it will be used in the 2006 Lexus RX 400h luxury SUV that went on sale April 15, along with the Toyota Highlander Hybrid that will debut in June. Both models are expected to mate to a 3.3-liter V-6 engine with front and optional rear motors, in a package producing 270 horsepower. Other Toyota hybrid models will be sure to follow. With Nissan and Ford already HSD licensees and other automakers reportedly investigating this acclaimed hybrid system for their own models, Toyota has clearly gambled big with its huge investment in this technology, and won big as well. Well surely be seeing a lot of Toyotas Hybrid Synergy Drive in the years ahead.